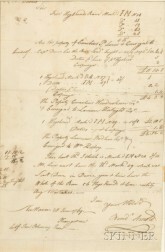 Save your search - find out immediately when "Benedict Arnold" is available at auction! American School, Late 18th/Early 19th Century Portrait of Revolutionary Colonel Christopher Greene (1737-1781). American School, 19th Century Landscape Along the Hudson River. American School, 19th Century/20th Century Portrait of Dr. William Burnet, Surgeon General of the Army.